Concrete kitchen countertops are more affordable than granite but just as elegant. Learn how to build the concrete form and pour and trowel concrete to make your own! 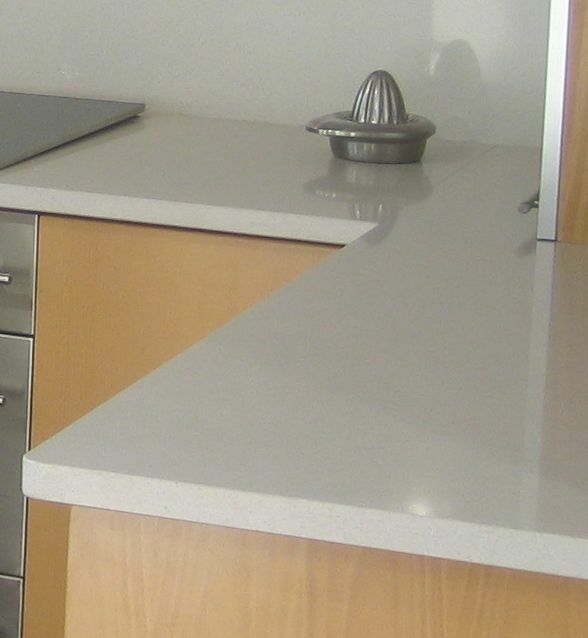 Concrete countertops in household kitchens are really gaining in popularity lately. Theyre not all that expensive to build in terms of materials. The big issue is labor. Building a concrete countertop is a great DIY project but keep in mind that its not a trivial project for the first timer. Want to know how to make a concrete countertop? Read on! First, make a choice of where to build the countertop. The countertop can be built off-property and then installed in the kitchen, or built right on the kitchen cabinet. Building on the kitchen counter will save the hassle of moving the completed countertop. Think of the form as a shallow box with knockouts precisely positioned for sink, faucets, etc. The horizontal strength of the concrete form comes from wood boards, just as with concrete forms for patios, driveways, etc. This particular form uses 2 X 4 boards for the outside edge of the countertop. Since pine is porous as well as rough, melamine strips (melamine is a form of vinyl) are added on the inside of the form. This allows for a slick, smooth surface. Place a solid melamine sheet in the bottom of the form. This may be removed later, after the concrete has cured sufficiently. Cover any bare wood with electrical tape. This prevents the wet concrete from sticking to the wood. Now apply a bead of silicone caulk to the inner corners of the form. Do this carefully so the completed countertops edges will be smooth and rounded. Knockouts for the sink and faucets are easy to use. They contribute to the cost of the concrete countertop project, but they simplify things and ensure a professional looking finish. The thing to focus on when using these knockouts is placing them precisely where they belong. Cured concrete isnt very cooperative if this step isnt right. Once theyre properly placed, set steel mesh inside the form for reinforcement. Keep it within, but not past, an inch of the edges. Not only will steel reinforcing mesh lend strength to the concrete countertop, but it also minimizes cracking that happens when the cement and aggregates dry and cure. There are actually two concrete pours. The first concrete pour is just drier-than-usual concrete. The following pour contains the other ingredients which will give the countertop color and beauty. This mixture wont be self-leveling because of its dryer nature. Take care to tamp it down by hand. Its critical to eliminate all air pockets in the concrete mix. After the counter has cured for approximately two hours, start troweling the concrete with a steel trowel. Don't get overly aggressive with it. This will draw the concrete aggregates upwards. The entire countertop will be weak after curing. Let the concrete cure for at least 24 hours before removing the form from the finished countertop, removing the knockouts, and applying the sealant. If the project is taking place in a dry climate, maintain a moist burlap cloth on the exposed countertop. The longer it cures, the more strength the finished product will have. Remove the form carefully. If it hasnt been built on the counter, move it there carefully. Have one or two buddies help. It needs to be shown off anyway! Do you have any experience with kitchen remodeling projects like this? Feel free to share your experiences in the comments box below. Thanks!